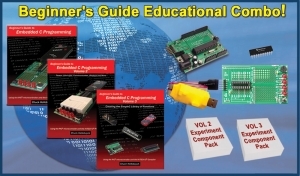 This page has all the support downloads for my book "Beginner's Guide to Embedded C Programming". 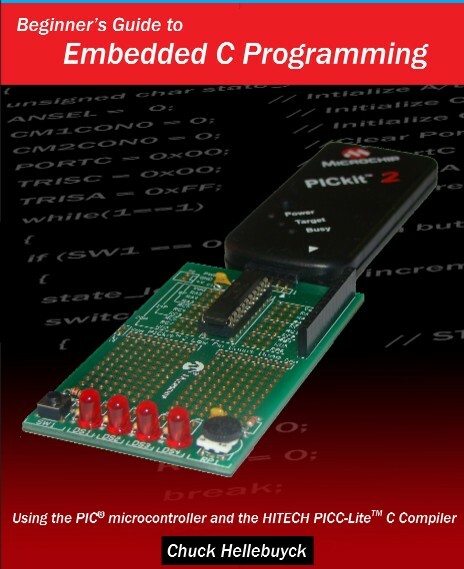 Special Note: For all the Beginner's Guide to Embedded C Programming Books, I recommend you download the archived version of MPLAB version 8.30 which also includes the HI-TECH compiler version 9.60-PL5 . The book software will work without needing the modifications described in the Errata/Correction sheet. You can get it from the link below. The link below contains all the source code for the projects in the book. The link below contains all the corrections for the book in a PDF document. The link below contains all the schematics in the book in PDF format so they are easier to read and zoom in. The book originally used the PICkit 2 Starter Kit from Microchip but that has been discontinued. Microchip open sourced the design so you can get the replacement programmer, the CHIPINO or CHIPINO Mini at Howtronics.com. Or get the whole package from Nuts & Volts Magazine by click on the add below. Get the full set of books and supporting hardware from Nuts & Volts Magazine - Online Store.